Home + News + Be Careful with That Hazardous Waste! Be Careful with That Hazardous Waste! Many workshops, industrial facilities and laboratories generate small quantities of hazardous waste. Anything from contaminated solvents, used oil and high-performance liquid chromatography (HPLC) waste needs temporary storage before safe disposal. OSHA inspectors check for flammable liquids in open containers. They impose fines for non-compliance to regulations and putting employees at risk. Of course, if hazardous waste catches fire, the consequences could be much worse. So, how do you accumulate and handle small quantities of flammable liquid waste safely? Sealed hazardous waste containers prevent ignition sources from reaching the flammable material. They also prevent oxygen supply from reaching a fire inside the container. Ground and bond the flammable liquid container being emptied to the receiving funnel. This prevents static electricity from sparking while pouring. Flame arrester tubes on safety funnels absorb and dissipate heat. This prevents sparks or any ignition source from reaching the drum’s flammable liquid contents during pouring. Spill containment platforms capture spills before they spread in an uncontrolled way. 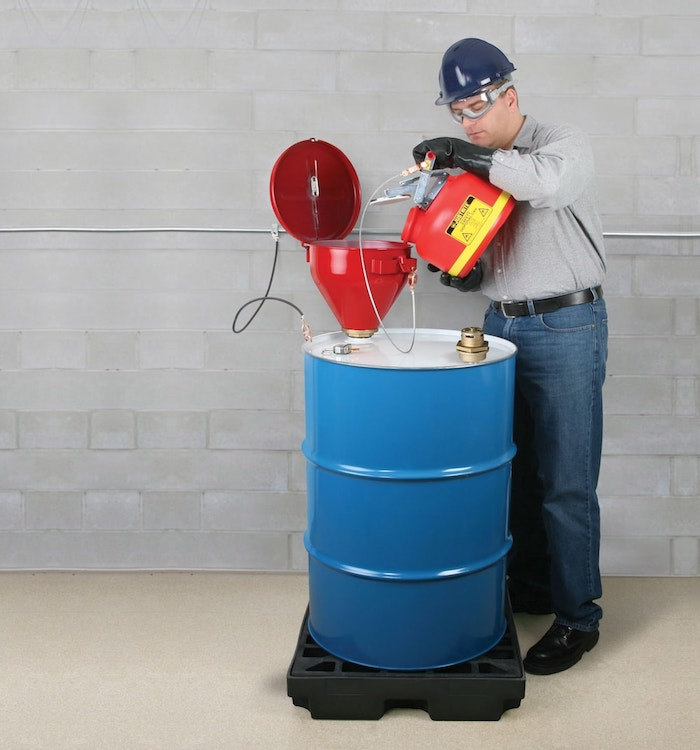 Collect hazardous waste solvents by using large-diameter safety drum funnels with flame arrester tubes. These prevent ignition sources from entering the drum. Funnels fit onto standard 30- or 55-gallon drums and have a hinged lid to seal the contents when not in use. If left open, a fusible link in the self-closing lid melts at 165 F (74 C), safely shutting the lid. 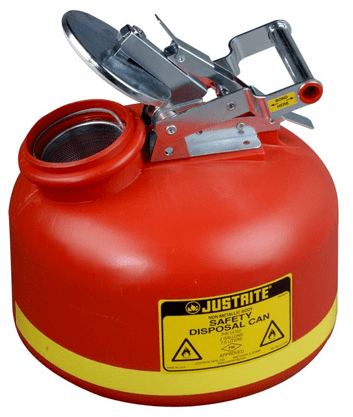 Safety disposal cans feature large spouts to reduce the risk of spilling flammable liquids while pouring. The lid locks open to facilitate easy filling and has a built-in flame arrester. Lids automatically vent to prevent the hazardous waste container from exploding during a fire. 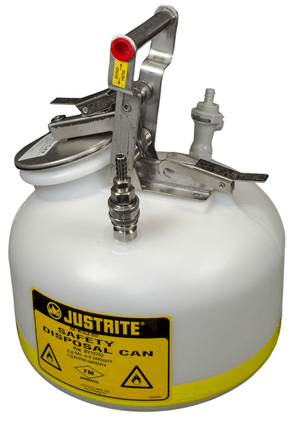 Justrite safety disposal cans with quick disconnect fittings are suitable for laboratory environments. HPLC machines connect to the hazardous waste containers using flexible tubing. Waste products accumulate in the can. When the can is full, a simple disconnection of the quick fittings does not affect the HPLC machine at all. Cans are FM-approved and available in 1, 2 and 5-gallon sizes. Attach safety drum covers to 30- or 55-gallon drums. They create a receptacle for solvent soaked rags, wipes and other combustible trash. The self-closing lid provides an air-tight seal to the drum. 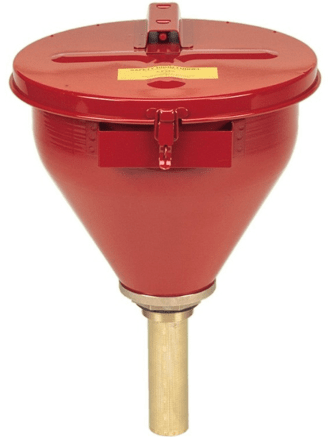 A pressure vent ensures that the drum will release a build up of pressure rather than explode in fire conditions. Accumulate small quantities of hazardous waste at your worksite without the risk of injury. Justrite waste disposal products keep you in compliance. Browse our safety cans and containers here. Browse our drum funnels and equipment here.